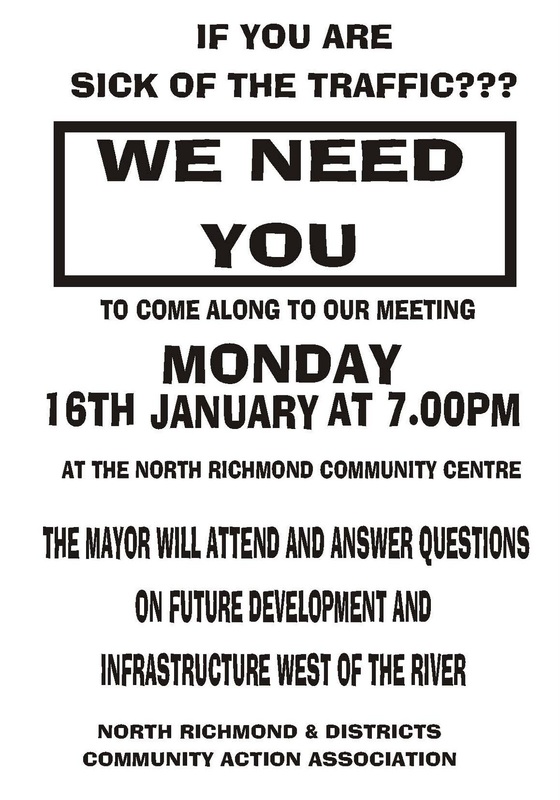 Kim Ford, Mayor of Hawkesbury City Council, has accepted NRDCAA’s invitation to attend the next community meeting which is being held on Monday 16/1/12 at 7pm at North Richmond Community Centre, William Street, North Richmond. 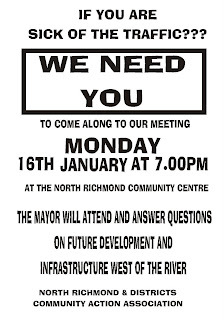 This is your opportunity to question the Mayor on councils plan to ease the already inadequate infrastructure for the existing population for North Richmond and surrounding areas. The traffic congestion is a major problem which impacts on all residents west of the river as well as residents and businesses in Richmond. As a matter of courtesy to the Mayor we would like to forward him questions prior to the meeting. Send your questions to Michael Want at mrjwant@gmail.com by Thursday 12/1/12. Please come along to this important meeting and impress on the Mayor that the community really wants action on this matter NOW!